I lived in San Francisco for 8 years and never went to Alcatraz until this weekend. I could never think of a good reason to visit a dilapidated prison. But I was struck by the magnitude of this mass of rock and its crumbling facades, the undeniable beauty of the ocean and the city. It was the perfect setting for this show. Ai Weiwei is such a force that he can successfully conduct a conversation about freedom and confinement without even setting foot on the site. These installations are so titanic without overpowering the space; they also enable the public to see some of the buildings that are not usually accessible. The experience of being in this space is hard explain but there are so many contradictions: the constricting cells, and the wide openness of the industrial buildings, the degrading surfaces and the bubbles of old glass letting in the bold illumination of the sea. 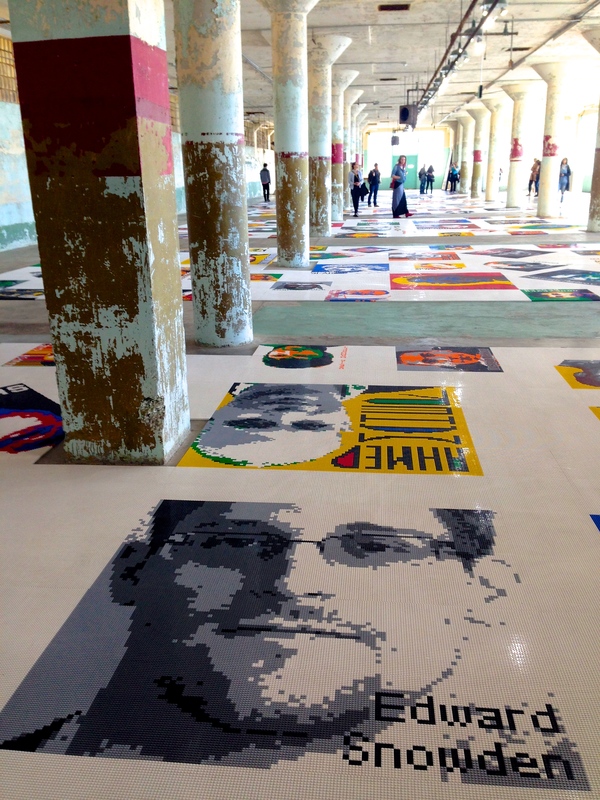 Ai Weiwei tinkers with these contradictions so consciously: the portraits of detained or persecuted people are made of Legos, giving them a primary and pixelated look. Soft little ceramic flowers fill up bath tubs and latrines, you almost miss them if you aren’t looking for them, quiet gestures of solace in an environment of humiliation and chaos. In the hospital, there were two tiled rooms the size of small bathrooms where the mentally ill were contained. Glass block facing the ocean allowed a soft light in but once the sun went down, these rooms went black. 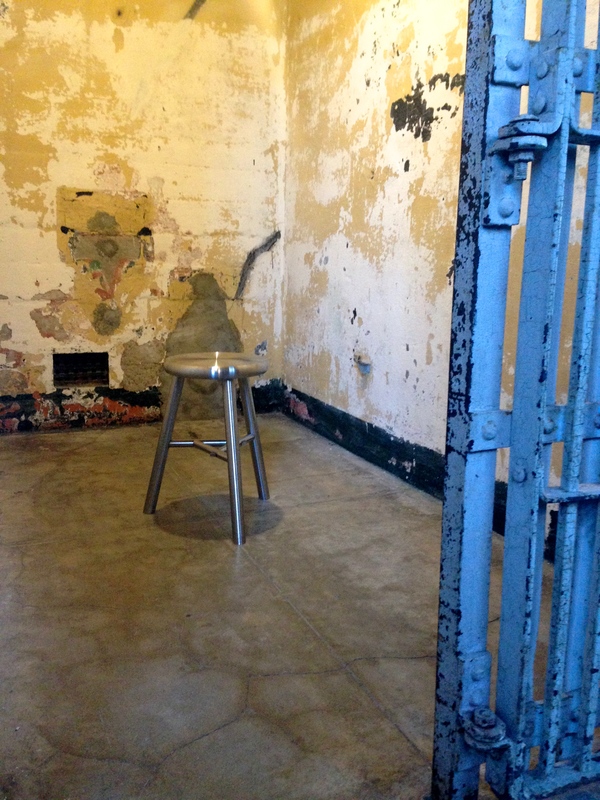 Ill prisoners were kept in solitary, often restrained. Ai Weiwei piped the sound of Tibetan monks chanting into one room and at a certain point I was the only one in there. I closed my eyes and the sudden, sonorous vibration of the monks’ deep bellow shook my ribcage. In the other room, the sound of Hopi ritual drumming and chanting bounced off the tile walls. Prison and war are our primary industries in the U.S and it is almost hard to separate them when you are in these interiors. Alcatraz was a military prison, the remnants are still ferocious, like the cannons that shot 440 lbs cannon balls. These spaces are like a war on the body, a constant attack of surveillance, a void of comfort, a wasteland of connection. The primary tool of these industries is dehumanization; when we cease to acknowledge a person, or a country as human, we can criminalize them, we can refuse to help, we can drop bombs. And still, this artist who deserves to be on the world stage, is able to convey these very powerful messages about injustice, about the danger of silence, and that is not possible in other countries. At the end of the exhibit, there are shelves of postcards with the names of political prisoners printed on them. Ai Weiwei teamed up with Amnesty International to ensure that these prisoners would receive the postcards and visitors to the exhibit were encouraged to write. This was perhaps the most powerful part of the installation, that as a viewer, you were not simply left with this heavy feeling of futility, but that you could sit down and convey your own message. An art guide told me that 8 people had been released since the exhibit opened. This is what great art does: it makes an undeniable stand, but it invites questions and evokes a sense of personal responsibility in everyone who witnesses it. It is by nature, inclusive, calling attention to the artificial boundaries that distance us from other people. 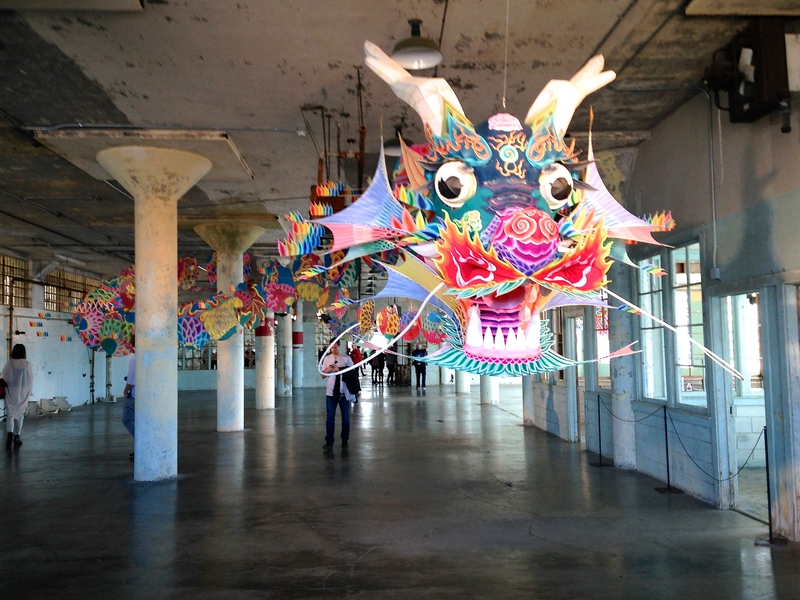 This entry was posted in art and tagged Ai Weiwei, Alcatraz, art, Political Prisoners, San Francisco by Miranda Culp. Bookmark the permalink.